CL-SOM-iMX6 is a miniature computer-on-module (CoM) / system-on-module (SoM) board designed to serve as a building block in embedded applications. 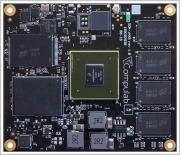 CL-SOM-iMX6 is based on the NXP i.MX6 application processor featuring a highly scalable single/dual/quad core Cortex-A9 CPU at up to 1GHz coupled with powerful graphics and video processing units. The processor is supplemented with up-to 4GB DDR3 and up-to 32GB of on-board eMMC. In addition, the CL-SOM-iMX6 features extensive connectivity with a wide range of industry standard interfaces – GbE, PCIe, SATA, USB, RS232 and CAN bus. CL-SOM-iMX6 is provided with comprehensive documentation and full ready-to-run SW support for Linux operating system. From time to time CompuLab releases new software versions for CL-SOM-iMX6 in order to fix bugs, address component changes and add functionality. It is highly recommended to subscribe to the CL-SOM-iMX6 RSS Feed in order to receive automatic notifications about software updates. This page was last edited on 5 July 2018, at 11:53.